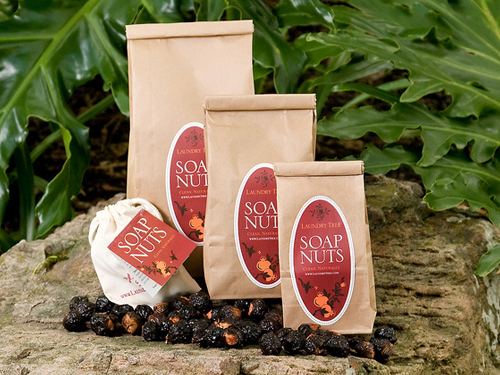 One of the more shockingly cool things I’ve come across recently is Soap Nuts by Laundry Tree. They are an alternative to laundry detergents and are actually organically grown dried fruit that are biodegradable, antimicrobial and work in HE washers! You just pop a few of these Soap Nuts inside the little white pouch shown above and throw it into your wash cycle and voila! Clean clothes. I need to finish up my supply of Seventh Generation laundry detergent—which we love—before I buy Soap Nuts, but I’m totally going to try these out! Wow, how are we so much alike??? Ha, yes, I use these! I love them! What? You already use these? You’re awesome. Well, if you use them, I’m definitely going to try them out! Can’t wait to see you next weekend! Hey! These are so nifty! How are your clothes after using them? Do they have any distinct scent? I want to try them too!